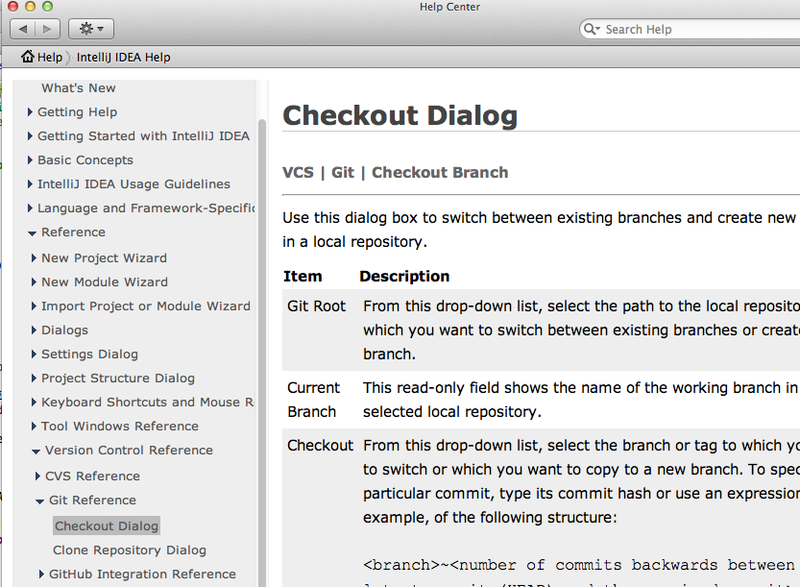 I cannot find the "Checkout Branch" dialog in the VCS - GIT menu, after I have cloned a GIT repo. You don't so much checkout a branch. You switch to one after checking out the project. Take a look at Help >Help Topics > IntelliJ IDEA Usage Guidelines > Version Control with IntelliJ IDEA > VCS-Specific Procedures > Using Git Integration > Managing Branches > Checking Out (Switching Between Branches) The online web help equivalent is also available. Thanks for pointing me to the right direction. But this help is rather hidden in the depth of the help system and not so easy to find. I was missled by the help system that comes along with intellij, as you may see in the screenshot attached. Is this part of the help system out of date ?